Rarely have I been so frustrated with a comic as when I finished reading New 52: Futures End Vol. 3, and surely I should know better. There's often debate regarding shared comic book universes as to whether every comic must "matter," or if there's room for mostly-disconnected shared-universe comics that "just" tell a good story. Err on the side of stories being too connected and you end up with something like Trinity War, an event whose main purpose turned out to be to itself lead in to other events. Err on the other side, however, and you get Futures End, which does also lead into Convergence, but in the main tells a variety of stories unlikely to be picked up anywhere else but that also don't end very conclusively here. One must believe very ardently that the journey is the thing, because Futures End is a lot of journey with little destination, and that feels very unsatisfying. Taking an extreme view, really only someone interested in Dan Jurgens's new Batman Beyond series should read Futures End (or for a sneak peek at Convergence, though that's probably better found in Convergence itself). Sure, it was a lot of fun seeing Jeff Lemire (presumably) write Frankenstein again, and even Keith Giffen's (presumably) Cadmus-escapee Fifty Sue story grew on me by the end. But Frankenstein dies (and partner Amethyst departs for an exciting adventure we'll never see) and Fifty Sue wanders off into the sunset, and so whatever the reader has invested into these characters essentially ends here. Fine, let's say, for a novel, but to follow (and sometimes, tolerate) these characters for forty-eight issues only to see no reasonable chance of their return is disappointing. And it might not even be so bad if, for instance, Fifty Sue were revealed as a rival AI who gives her life to stop the book's villainous Brother Eye, or were it made clearer that in dying, Frankenstein changed the future such to save Black Canary's life (whom he seemed, in the book's very first chapter, to have killed), or the like. But the toothlessness of a large part of Futures End is apparent from this volume's first chapter, in which Lois Lane vows to bring down Cadmus, something she never does, and both the Earth 2 characters that Green Arrow guided Lois to find and even Green Arrow himself only appear briefly before they, too, never factor into the story again. 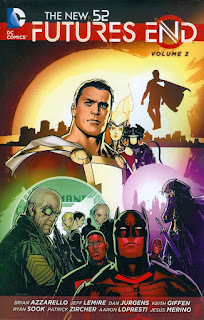 It is not that so many of Futures End's storylines end here never to be touched again, so much as that neither do they end up being all that important even in the story itself -- Cadmus, King Faraday, "Sergeant" Rock, Fifty Sue, Ethan Boyer, Stormguard, Key and Coil, whatever's in Cadmus's vault, what caused the bad blood between Superman and Batman, and on and on. That said, what had been entertaining in Futures End before remained so -- the future Stormwatch; the plights of Batman Beyond Terry McGinnis and Red Robin Tim Drake -- and even what had been trying in Futures End Vol. 2 -- the cartoonish Fifty Sue story -- gained some depth this time around. Outlandish as it may sound, Futures End's breakout star may be the Earth 2 Lana Lang (between this and Greg Pak's Action Comics, Lana's having a good time of it lately). Lana's absurd choice to become a mother to Fifty Sue is surprisingly powerful, and the last-minute revelation of Lana's insect powers (read: Insect Queen) was a clever bit that redeemed much of what had gone before. Again, equally good too were the dual romances between Batman Beyond and the cyborg Plastique, and between Red Robin and half of the new Firestorm Madison Payne. The writers offered a couple cute scenes of Terry and Plastique, not the least of which Plastique introducing Terry to pizza but finding that Coke exists in the future; even as I'd long since known of Terry's death, the writers achieved good emotion by dint of the Plastique relationship. Equally I liked Tim and Madison, and I'd be eager to read Jurgens's new Batman Beyond -- where Tim at least retains some knowledge of all of these events -- except I can't quite find that Madison is actually appearing in that book, either, which might negate the importance of Futures End altogether. Futures End does introduce the Brainiac threat at issue in Convergence, though this is tempered somewhat -- my fault I guess, and not the story's -- by my knowledge of Convergence proper. Essentially the Convergence aspects of Futures End are a bunch of background images of distinctly non-New 52 characters, including the Justice Society and Terra Tara Markov. Though I don't underestimate the momentousness of an image of the pre-Flashpoint Jay Garrick in a book with "New 52" on the cover, it's just an image, and such was probably more powerful when readers didn't already know Convergence was coming. In comparison with a walking, talking Jay Garrick (or his compatriots) in Convergence, the Futures End aspects seem a lot of hubbub and not much content. New 52: Futures End Vol. 3 is no more a seamless ending to Futures End than it is a seamless ending to DC Comics's New 52 endeavor (we might have needed a Pandora appearance somewhere), though I do appreciate New 52-centric characters like Frankenstein and Grifter getting one last spotlight before the era comes to a close. On the art side, I'll make special mention of Aaron Lopresti drawing Amethyst one last time, and also Andy MacDonald, who draws a human, unassuming Superman and whose work I'd like to see more of in the DC Universe. But overall I have a hard time recommending Futures End, knowing as I do that really getting into this book will ultimately just lead the reader to heartbreak. The only thing that frustrated me more than this series's non-ending is the fact that they never bothered explaining what happened during the war with the Earth 2 survivors that led Superman to exile himself, nor his falling out with Batman. In fact, that whole war seemed like a much more interesting story than anything we got to see in this series. I believe this "War" is the actual "Darkseid War". Even if the connection still thin. The events of Darkseid War follow the event of Worlds End in some way. And the difference here, is there is no place for the Earth-2 caracters in the Earth-0 continuity because of the beacon destroyed by Tim "Beyond" Drake. So it is not the actual same "war" as described in Futures End. But, with what happen to Superman in "Darkseid War", I presume he could have done something very wrong. And I understand very well the problem of Futures End (even if I enjoyed the journey).